This course is oriented toward therapists and professionals seeking a greater understanding of the role of vision beyond eyesight for helping their clients. While the educational and health care fields now embrace auditory processing as distinct from hearing, we are still in the relative dark ages when it comes to vision processing. It’s time to move forward! Watch this seminar recording and learn how to differentiate visual efficiency from visual processing, and how to screen effectively to help identify visual problems. You’ll also learn how to collaborate with developmental optometrists and how developing visual abilities can provide a better platform for overall sensory processing and integration. Sample procedures will be given in an interactive workshop format that will enable you to help a wide variety of patients having difficulty with visual processing. 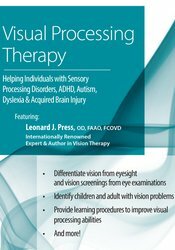 This course will leave you with a new and exciting perspective on visual processing and therapy. Compare and contrast eyesight and vision. Define the role of vision in early intervention. Identify visual problems impacting learning. Describe common ground between other therapies and vision therapy. Explain how to screen for vision disorders. Formulate therapeutic interventions for vision problems. Is there an age at which it’s too early or late to intervene? Dr. Leonard J. Press, O.D., FAAO, FCOVD, is board certified in optometric vision therapy by the College of Optometrists in Vision Development. He is a diplomate of the American Academy of Optometry in Binocular Vision and Perception. A graduate of the Pennsylvania College of Optometry, where he completed his Residency in Pediatrics and Binocular Vision, Dr. Press served as Chief of the Pediatric Unit at the Eye Institute of the College. He subsequently served for 15 years as Chief of the Vision Therapy Service at the State University of New York's College of Optometry. Dr. Press is a consultant on visual disabilities for the National Board of Medical Examiners. He is past-president of the New Jersey Society of Optometric Physicians, and of the College of Optometrists in Vision Development. He is current chair of the Pediatrics/Binocular Vision Committee of the American Optometric Associations. Author of three textbooks and over 100 articles in ophthalmic journals, Dr. Press presents continuing education lectures and seminars on vision nationally as well as internationally. Currently he is Optometric Director of the Vision and Learning Center in Fair Lawn, New Jersey, one of the first sites in the country to be accredited as a private practice Residency program for vision therapy and rehabilitation. Financial: Dr. Leonard Press maintains a private practice. He is in a leadership position with the Vision and Learning Center. He is an author for Mosby and Butterworth-Heinemann publishers and receives royalties. He receives a speaking honorarium from PESI, Inc. Non-financial: Dr. Leonard Press is a diplomat of the American Academy of Optometry in Binocular Vision and Perception. He is a consultant for the National Board of Medical Examiners. He is the current chair of the Pediatric/Binocular Vision Committee of the American Optometric Associations. Illinois Early Intervention Professionals: Approved by the Illinois Early Intervention Training Program for 2.0 total self-study contact hours in the area(s) of .25.25.51.0. Expires: 12/31/2018.